An 1842 graduate of West Point, Daniel H. Hill served as chair of the mathematics departments of Washington College (now Washington and Lee University) and later of Davidson College. He left Davidson to become superintendent of the North Carolina Military Institute. 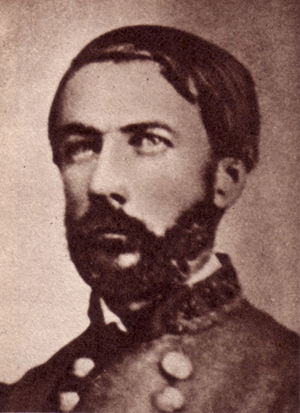 During the Civil War, he was eventually promoted to lieutenant general and served under Robert E. Lee during part of the war. After the war, he published two magazines and a newspaper before being offered the presidency of the university in 1877. In the first history of the university, Hill’s administration was described as the most efficient in the history of the institution. He reduced the number of lower classes in the preparatory department, raised standards, increased attendance and “brought the university to the attention of the state.” Hill himself taught classes in mental and moral philosophy and political economy. In 1882, the board of trustees awarded him an honorary Doctor of Laws. He resigned in 1884 for health reasons and moved to southern Georgia. After resting a year, he accepted the presidency of Georgia Agriculture and Mechanical College at Milledgeville. Personal: Hill was born July 12, 1821, at Hill’s Iron Works, S.C. He married Isabella Morrison on Nov. 24, 1848, and they had nine children. He died Sept. 24, 1889, at Charlotte, N.C., and was buried at Davidson College.